If you need to work in the air, yet be safely grounded on heavy rail tracks, then look no further than the brilliantly innovative Badger. 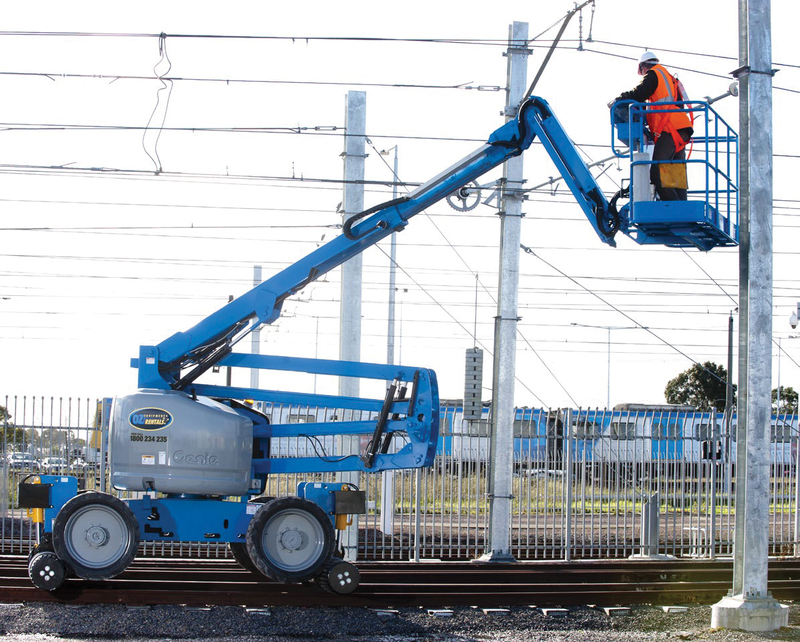 Manufactured exclusively for Victorian-based Oz Equipment Rentals for the highly variable rail conditions in Australia, the Badger is an adaptation of the rough terrain Genie Z-45/25 JRT articulated boom. The brainchild of Oz Equipment Founder Shane Bennett, the Badger innovatively extends or retracts to fit the three gauges used in Australia – narrow, standard and broad. Since coming to market in 2013, the Badger has been conscripted for use in the Victorian Governments’ Level Crossing Removal project1, for the tram depot refurbishments in Melbourne and in stabling yards. Given the Badger’s overwhelming market response since launching three years ago, Oz Equipment Rentals has added additional machines to its fleet. “We’ve even sold a couple of machines to mining companies, with others interested too,” said Bennett. Moreover, with the plethora of rail infrastructure projects in the pipeline around Australia such as Melbourne Metro Rail Project2 and Sydney’s light rail projects3 to name just two, it’s fair to expect the Badger will be busy for the foreseeable future. The development of the Badger is a classic example of Genie 360 Support, which takes care of every aspect of a customer’s AWP needs from initial sales and service through to technical support, operator training, and maintenance “The ongoing development and enhancement of the Badger is an example of how Genie continually thinks outside the square and provides great after sales service,” said Ely. The $10.9 billion4 Melbourne Metro Rail Project2 is being developed by the Melbourne Metro Rail Authority and is one of Australia’s largest infrastructure projects. In summary, it involves two nine-kilometre underground rail tunnels that will transform Melbourne’s public transport system. The project will expand the City Loop, enabling major improvements in capacity, reliability and efficiency of train lines serving Melbourne's growth areas in the north, west and south-east. It will also create 3,500 jobs during peak construction, and will include five new underground stations to be located at Arden, Parkville, CBD North, CBD South and Domain5. The $2.1 billion CBD and South East Light Rail3 is a new light rail network for Sydney, currently under construction. The 12km route will feature 19 stops, extending from Circular Quay along George Street to Central Station, through Surry Hills to Moore Park, then to Kensington and Kingsford via Anzac Parade and Randwick via Alison Road and High Street. Construction will be completed in 2018 and services will start running in 2019.